Pest description and crop damage Small aphids, light green or pinkish green, which secrete a sticky honeydew that cakes the seed head. They attack red clover, alsike clover, and white clover. The clover aphid, N. bakeri, significantly reduces red clover seed yields in western Oregon if not controlled early in the season. A hay or silage crop is usually taken in mid-May to early June; begin inspecting the regrowth about 2 to 3 weeks later. Look between the leaf stipules and the stem, which is where this aphid initially begins to accumulate. When at least half the stems show signs of aphids-this is usually well before bloom-apply insecticide. Bloom and postbloom treatments do little to prevent honeydew problems or increase seed yield. acetamiprid (Assail 30SG) at 0.047 to 0.075 lb ai/a. PHI 56 days. This product is toxic to bees. Do not apply while bees are actively visiting the treated area. Do not apply more than one time per crop cycle. Begin applications when thresholds have been reached. Thorough coverage is important to obtain optimum control. Label is for OR, ID, and WA only. bifenthrin (Bifenture EC, Brigade 2EC, Discipline 2EC, Fanfare 2EC, Fanfare ES, Tundra EC) at 0.06 to 0.1 lb ai/a. REI 12 hr. Do not apply to blooming crop or allow to drift while bees are actively visiting bloom. Do not make more than 3 applications per crop year. Allow at least 21 days between treatments. Do not graze clover after applying. Do not cut treated clover for hay or forage. Do not use harvested seed for sprouting. No part of the treated field, including seed, seed screenings, hay, forage, or stubble, may be used for human or animal feed. Processed seed must be labeled. 24c SLN: OR-040039, OR-070013, OR-170012, ID-080011, ID-040009, ID-070009, ID-060023, ID-130004, WA-040027, WA-070015. chlorpyrifos (Lorsban Advanced) at 0.5 to 1.0 lb ai/a. REI 24 hr. This product is highly toxic to bees. Do not apply when any clover bloom is present. Do not make more than one application per crop year. Do not graze clover after application. Do not cut treated clover for hay or forage. Do not use harvested seed for sprouting. No part of the treated field, including seed, seed screenings, hay, forage, or stubble, may be used for human or animal feed. Processed seed must be labeled. 24c SLN: OR-090010. Oregon only. flupyradifuron (Sivanto Prime) at 0.09 to 0.14 lb ai/a. PHI 14 days. Apply in late afternoon, evening, night, or outside of daily peak foraging periods to minimize exposure to pollinators. Do not apply more than 0.365 lb ai/a per year. Retreatment interval 10 days. 24c SLN: OR-160008, ID-150002. malathion at 1 to 1.25 lb ai/a. REI 12 hr. Apply to clover in bloom only in evening or early morning, when bees are not working in the field or hanging on the outside of the hives. Apply when aphid population is low. 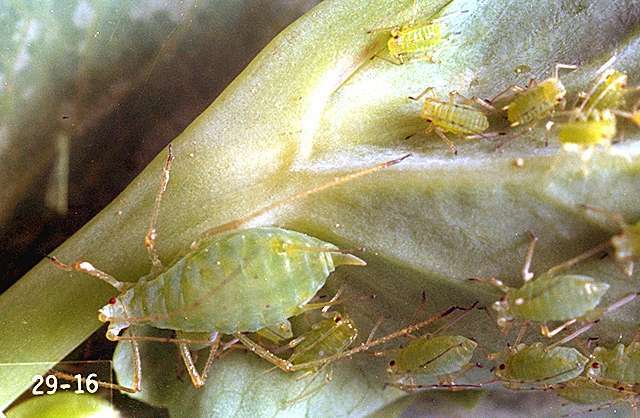 Check field for aphids before heads form by looking under basal leaf sheaths, and treat before aphids migrate from the sheaths to the seed heads. oxydemeton-methyl (MSR Spray Concentrate) at 0.375 to 0.5 lb ai/a. PHI 21 days. REI 15 days. Chaff from seed crop may be used for feed or forage, but do not cut green crop for these purposes. Do not apply more than two times per crop cycle. Retreatment interval 14 days. Apply by air, chemigation or groundboom.